Fermanagh & Omagh District Council has announced the development and establishment of two new Disability Sports Hubs in the district. The Council has been working in partnership with Disability Sport NI to deliver this project with funding provided by the Department of Communities, via Sport NI. The project represents an overall capital and revenue investment of approximately £150,000 and this has facilitated the purchase of tandem bicycles, hand cycles, track chairs and trikes. Speaking at the launch of the Disability Sports Hubs project, the Chairman of Fermanagh and Omagh District Council, Councillor Stephen McCann said “ Fermanagh and Omagh District Council is committed to working in partnership with other key stakeholders to deliver projects which add value to the quality of life of the people of our district and I believe that the development of the Disability Sports Hubs through our partnership with Disability Sport NI, is tangible evidence of the benefits to be accrued from such partnerships. 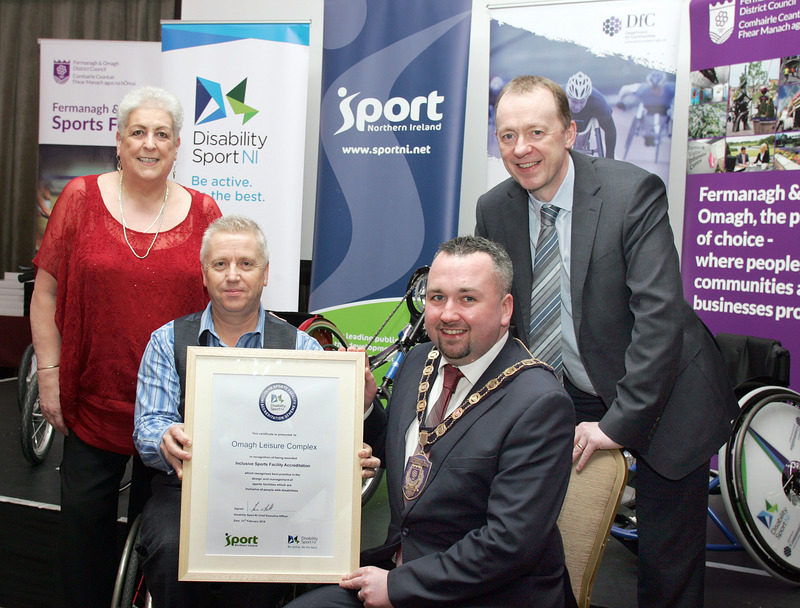 The partnership has also secured “Inclusive Sports Facility” accreditation for Omagh Leisure Complex, the second Council facility to have achieved this prestigious award, the other being Fermanagh Lakeland Forum. The Hubs will be located at the Fermanagh Lakeland Forum, Enniskillen and Omagh Leisure Complex and will provide a range of activities and programmes that will be disability specific as well as providing inclusive opportunities for participation in a wide range of leisure and sports programmes. Through this project the Fermanagh and Omagh District Council aims to address one of the key themes of the Fermanagh and Omagh 2030 Community Plan by helping to improve the physical, mental and emotional well-being of the local community. By working in partnership with Disability Sport Northern Ireland, the Council is striving to improve access and inclusion to sports facilities and programmes for all people across the District. The substantial investment in local facilities and disability sports equipment highlights the Council’s and Disability Sport NI’s commitment to ensuring opportunities will be facilitated and sustained for the foreseeable future. The Disability Sports Hub Project is funded by the Department for Communities through Sport NI and managed by Disability Sport NI in partnership with Fermanagh and Omagh District Council. “I am delighted that the Department is able to support the implementation of the disability sector’s ‘Active Living: No Limits’ Action Plan that seeks over the next 5 years to bring about positive change to the social, recreational and sporting life of people with disabilities.